Something terrible has happened. Something really, really terrible. I’m not sure if I’ll ever recover. Ok, so maybe I’m being slightly dramatic. But only slightly. If you really want to know what happened we’re going to have to go back to the beginning. It started months ago when I was at the grocery store. I browsed the shelves carefully picking out the sundries on my list which, this trip, included peanut butter. I plopped a jar in my basket and carried on with my shopping. It was only after I got home that I discovered that something had gone terribly, horribly wrong. As I reached to put the jar of peanuty-goodness on my shelf I noticed something amiss with the label. Upon closer inspection my darkest fears were realized. The peanut butter was CRUNCHY. Now I’ll admit that every so often when the planets are properly aligned I can enjoy a little bit of crunchy peanut butter but at no point have I ever had the desire to consume an entire jar of the stuff. In general I don’t like thingys in my orange juice, I don’t like walnuts in my brownies and I do not like crunchy in my peanut butter. “How could this have happened?” I wondered to myself. I never make mistakes like this. I’m a really careful food shopper, when I was a teenager I would be sent to chaperone my older step-brother on food shopping trips because everyone knew I DON’T MAKE THESE KINDS OF MISTAKES. * I suppose even the best must make mistakes sometimes and now I had to pay for mine. I’m on a budget these days and even if I wasn’t I really hate wastefulness. I knew that if I went out and bought new creamy peanut butter that no one would eat the crunchy and it would sit there being wasted and junking up my shelves. Probably forever. 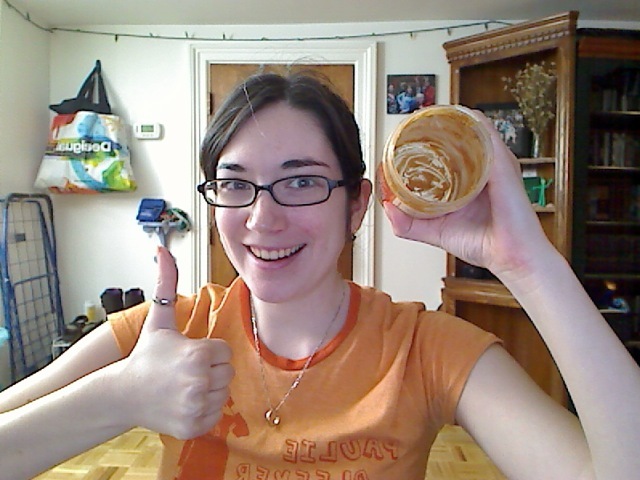 And so, surrendering to my circumstances, I made a vow; I would finish that damn peanut butter. Days became weeks, weeks became months, fall became winter and finally spring. I ate the peanut butter but I ate it slowly. But finally, with summer on the way and the threat of unsatisfactory picnic sandwiches looming, I did it. I finished the jar. With a smile on my face I a scraped the last usable bits from the edges. It was over. I was free. I was wrong. A few days later I found myself once again in the grocery store. After filling my basket with supplies for dinner I made my way to the peanut butter isle and grabbed a jar. I hesitated for just a moment before placing it in my basket. Something didn’t feel quite right. Slowly I turned the jar around and low and behold it was once again crunchy. How could this be? I could have sworn I was looking at the word “creamy” when I picked it up. Cautiously I placed it back on the shelf and picked up a jar with a different color label that definitely said “creamy” on it. Sure I had dodged a bullet I headed to the register confident that things were looking up. I noticed it while I was putting the groceries away. 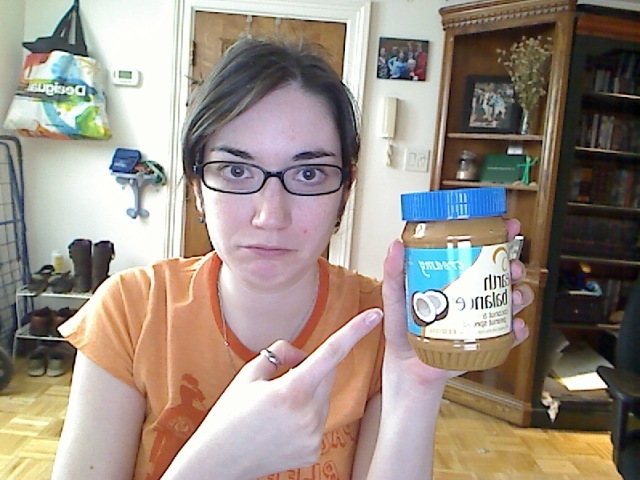 While the jar I had brought home did say “creamy” it was not regular peanut butter, it was coconut & peanut spread. I was worried, I’ve never really been a fan of coconut. I can tolerate or even enjoy it sometimes but those are usually few and far between. Maybe I’d like it. Maybe I wouldn’t even taste the coconut. There was only one way to find out. So the next day, needing to grab a quick bite before catching a train, I quickly whipped up a peanut butter (well, technically peanut coconut & spread) and jelly sandwich. I took a bite. At first it was Ok. And then it wasn’t. A very strong coconut flavor filled my mouth. Way too strong. It tasted awful. There was no way I could finish this sandwich let alone an entire jar. I had Luke try it and he didn’t like it either. I was devastated. That day I left to catch my train unsure of what I was going to do. After months of sticking to my guns and forcing my way through the crunchy, I was back to where I started. Only worse. I knew I couldn’t go on like this. 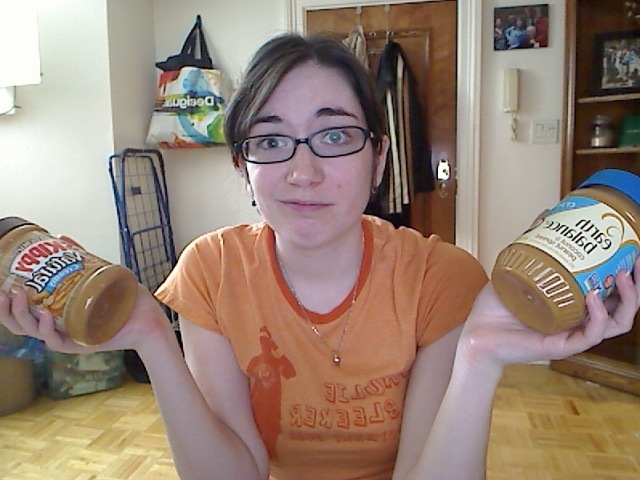 A few days later I broke down and bought a new jar of regular creamy peanut butter. It’s delicious. I suppose things are better now, my sandwiches sure are, but that dammed jar of coconut and peanut spread still sits in my cupboard as a reminder of my failure. I’m pretty sure it’s mocking me. *In all fairness to my brother I should also mention that this was not the only reason I went with him. It was also to translate my mom’s grocery lists since I’m probably the only one who really knows how to read them. For example, she might write “paper towels” but that means a specific brand of paper towels and GOD FORBID you come home with the ones with stuff printed on them.